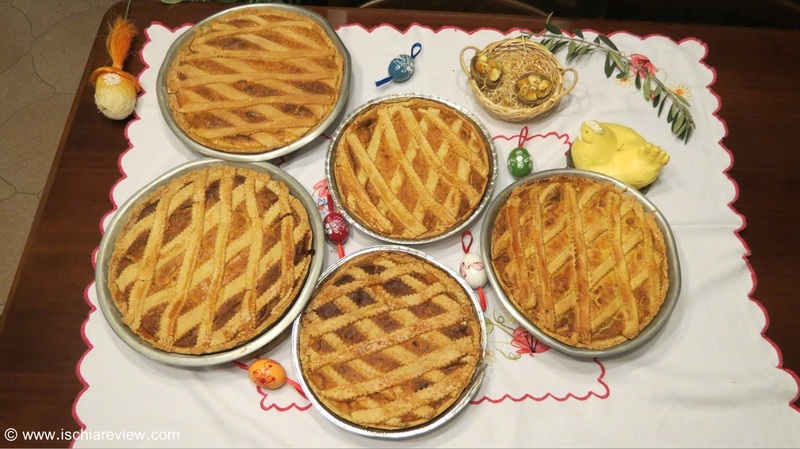 La Pastiera is a delicious tart made in traditional Neopolitan style in order to help celebrate Easter. Ischia Review explains how you can celebrate Easter with this traditional Italian dessert. Italian families make three or four of these tarts at a time and exchange them as gifts with other members of the family. Some of the ingredients might not be found at large supermarket chains but should be available in specialist Italian delicatessens or mini-markets. The dough of the base is a typical Pasta Frolla that can be made a day in advance using the above ingredients. Cover the grain in water with the knob of butter for a couple of hours and prepare the filling with 3 egg yolks, half a litre of milk, 3 heaped tablespoons of sugar and 3 level tablespoons of flour. Whisk the ricotta and mix it with the remaining sugar and the remaining egg yolks, the orange flower water, the candied/glazed fruit, the cream and finally the egg-whites. This recipe works for a baking tray 27-28cm in diameter and 5-6cm in height. Lightly grease the bottom of the baking tray and then roll out the dough. Take 2 thirds of the dough and place in the baking tray, ensuring that the bottom and the sides are all covered. Cut the remaining dough into strips that will be used to cover the filling in diagonals across the top, as in the picture above. Now place the filling inside the baking tray and spread evenly. Now take the strips of dough and place them across the top of the filling in diagonals as shown in the picture. Place the baking tray in an oven pre-heated to 180c or 370f for just over an hour. The filling should dry, almost completely, and the pie crust should lightly brown. If you serve the pie in its pan it can then be used for the whole of Easter, with many Italians choosing to eat it in the morning, giving them enough chance to burn off the calories over the course of the day. You can also add whipped-cream for a bit of extra moisture and variation.